Latigo Leather Curb. Same basic curb as CS200 made with Latigo Leather and Nickle Hardware. Heavy Harness Leather, stitched with double buckle, nickel hardware,with rawhide button. This leather Curb Strap is made from the finest Hermann Oak Harness leather and features Cowboy knots at the bit ends. Each piece is hand edged and rubbed for a smooth finish and with proper leather care it will last a very long time. 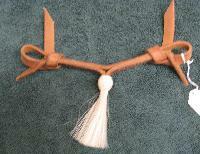 Harness Leather knot curb with hair tassel. 5/8" Harness Leather with brass buckle and leather loops. Quality Hermann Oak 1/2" Latigo leather Single Chain Curb Strap. This curb is hand rubbed for a smooth finish and features adjustable nickel buckles for a perfect fit! Quality Hermann Oak 1/2" Harness leather Single Chain Curb Strap. This curb is hand rubbed for a smooth finish and features adjustable nickel buckles for a perfect fit! Hermann Oak Latigo & Double Nickel Chain Curb Strap. The double chain provides wider more efficient pressure. 1/2" hand finished Latigo leather ends feature adjustable nickel buckles. Hermann Oak Harness & Double Nickel Chain Curb Strap. The double chain provides wider more efficient pressure. 1/2" hand finished Harness leather ends feature adjustable nickel buckles.